My food scraps provide bountiful feasts for my worms. The average American family throws out 25% of the food they buy – about $130 each month. Thurston County Solid Waste wants to help you waste less food this holiday season. The average American family of four throws out about 25 percent of the food they buy, to the tune of around $130 each month, and that number goes up during the holidays. Those festive parties and family gatherings drive us to make and serve too much food. This is often fueled by the questionable belief that it’s a bad host who runs out of a certain dish or doesn’t make each person’s favorites. When everyone goes home, there you are with a mountain of prepared foods and limited refrigerator space. Now what? Food gets wasted. Americans throw out about 204 million pounds of turkey meat after Thanksgiving. According to the National Resources Defense Council, just a single pound of turkey meat gobbles up resources equivalent to driving 11 miles to take a 130 minute shower! And the eating and wasting continues from Turkey Day through to New Year’s Eve, with too much of your food and your money being thrown out in between. Besides the environmental and financial impacts, it seems even worse to waste good food over the holidays, knowing that one in six Americans do not have enough to eat. We can do better. Here are just a few easy ways to help you waste less food this holiday season. Be realistic about how much you really need to cook. Estimate the headcount and use an online portions planner. If you’re hosting a party, it’s okay to run out of a dish or two. There are other tasty options, and your guests are there for the company. Carefully plan the entire meal and make a shopping list that includes quantities for each ingredient. Check your cupboards, fridge and freezer before you shop so you’ll know what you already have at home. Consider using smaller plates and smaller serving utensils. This slows down the folks whose eyes are bigger than their stomachs. Guests can take smaller servings of each dish and go back for seconds or thirds. Plan out what to do with the leftovers. If you want to donate to a church or food bank, call ahead for their hours of operation, and get information about critical safe food handling requirements. Send party-goers home with their favorites with a promise to eat them. Make sure you have the needed “to go” supplies. Store your leftover food in clear or well labeled containers. If it’s not going to be eaten right away, use your freezer. Plan what you can make with leftovers. Websites like www.bigoven.com let you enter multiple ingredients you want to use and then up pop recipes! Have a potluck where family and friends all bring leftovers—it’s an excuse for another party. Thurston County Solid Waste is helping residents reduce wasted food throughout the entire year. Visit our website and download the Waste Less Food Challenge information packet at www.WasteLessFood.com. It will help you see exactly what you’re wasting and provides tips on how to waste less. 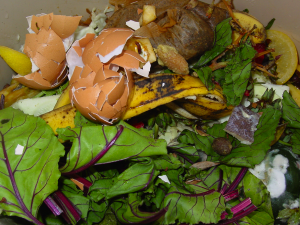 While you’re there, check out our radio contest and take our quick food waste survey. You can also invite us to give a fun and free presentation for your school, office, church, or community group—we can make it a potluck! For more information about the Waste Less Food Challenge and other tips and information on wasting less and saving more, contact Gabby Byrne at byrneg@co.thurston.wa.us or (360) 867-2284 or visit www.ThurstonSolidWaste.org.